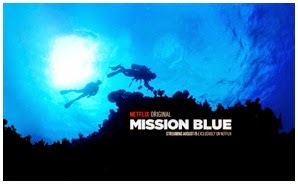 MISSION BLUE is an original documentary film that opened on FRIDAY, AUGUST 15th, in theaters and on Netflix (in cities, countries, and territories where the service is available). MISSION BLUE is the story of legendary oceanographer Dr. Sylvia Earle’s eye-opening wake-up call to save the oceans and the planet (as go the oceans, so goes the earth). MISSION BLUE is an amazing film that you can’t afford to miss. It is produced by Fisher Stevens (producer, The Cove) and Robert Nixon (producer, Gorillas in the Mist). In honor of confessional integrity: Fisher Stevens is my son. But even if he weren't, I'd feel obliged to let you know about MISSION BLUE, lest you miss an exquisite, informative, and very important experience. It is more than a film; it is a way of seeing the connectedness of everything, and of seeing how you fit into the equation. Sylvia Earle is one of a kind; an oceanographer who turned her attention and passions to championing the preservation of the seas, the importance of which most of us take for granted at our peril. Her Mission is critical to sustaining the planet and MISSION BLUE tells her moving, adventurous, and inspiring life story, which is played out against some of the most beautiful sights on earth, some of which are Hope Spots. These spots are special places that are critical to the health of the ocean ~ the earth’s blue heart. Some of these Hope Spots are already formally protected, while others still need defined protection. About 12 percent of the land around the world is now under some form of protection (as national parks, world heritage sites, monuments, etc. ), while less than 3 percent of the ocean is protected in any way. Mission Blue is committed to changing this situation. I agree that hopefulness beats despair. Why not take actions that reflect our beliefs and see what might result! I learned so much watching Fisher's film. The part about the Shark fins is so sad. The Coral Ocean off the Coast of Australia, amazingly tragic... OMG, our dear aquatic friends, many of whom are species way more advanced then we realize, need advocates. Sylvia Earle is exemplary . "Hope Spots", a brilliant place to start to redeem and reverse before the damage is truly beyond repair.